Transitions between two input clips using a bright glowing flash. The clips dissolve into each other, while each one gets a glow which ramps up and down over the duration of the effect. The Dissolve Percent parameter should be animated to control the transition speed. Transition Dir: Popup menu, Default: Dissolve Off to Bg . Dissolve Off to Bg: transitions from the current layer to the Background. Dissolve On from Bg: transitions from the Background to the current layer. If enabled, a transition is performed automatically between the first and last frames of the layer. If this is off, the transition is performed manually by animating the Dissolve Percent parameter. Dissolve Percent: Default: 0, Range: 0 to 1. Auto Trans must be disabled for this parameter to be used. It determines the transition ratio between the Foreground and Background inputs, and would normally be animated from 0 to 100 to perform a complete transition. The curve controlling this parameter can be adjusted for more detailed control over the timing of the dissolve. The speed of the dissolve between the From and To clips. When set to 1, the dissolve takes place over the entire duration of the effect. 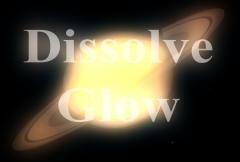 When set higher, the dissolve is shorter, although the glow ramp-up and ramp-down still takes the entire duration. Setting this to 10 can make the transition snappier and more like a flash-frame cut. Glow Brightness: Default: 6, Range: 0 or greater. Overall maximum brightness of the glow. Parts of the source clip that are brighter than this value get glowed. A value of 0.9 makes only the brightest spots glow. A value of 0 makes every non-black area glow. Overall color of the glow. The width of the glow. This and all the width parameters can be adjusted with the Width widget. Note that a zero glow width still enhances the bright areas; set the glow brightness parameter to zero if you want to pass the sources through unchanged. Relative brightness of the glow on the outgoing (From) clip. Rel From Width: Default: 1, Range: 0 or greater. Relative width of the glow on the outgoing (From) clip. From Offset Threshold: Default: 0, Range: any. Extra threshold to apply to the glow on the outgoing (From) clip. Relative color of the glow on the outgoing (From) clip. Relative brightness of the glow on the incoming (To) clip. Rel To Width: Default: 1, Range: 0 or greater. To Offset Threshold: Default: 0, Range: any. Extra threshold to apply to the glow on the incoming (To) clip. Relative color of the glow on the incoming (To) clip.